At our 16th annual CJFE Gala: A Night to Honour Courageous Reporting, we are honouring four individuals with CJFE International Press Freedom Awards (IPFA) for their extraordinary work. Over the years, CJFE has recognized a number of individuals from countries around the world who have risked their jobs, freedom and even their lives to report on important stories in the public interest. Gambian journalist Alagi Yorro Jallow was the recipient of our 2005 CJFE International Press Freedom Award, and has continued to defend and promote press freedom in The Gambia in the eight years since CJFE first recognized his important work. Jallow has recently published a book chronicling the breakdown of press freedom in The Gambia. 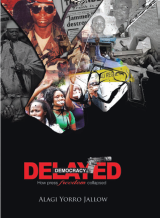 Delayed Democracy: How the Press Collapsed in the Gambia examines the effects that President Yahya Jammeh’s 1994 takeover of the Gambian government had on freedom of expression in the country and its proponents, including journalists, human rights defenders and government critics. Jallow is no stranger to the brutality dispensed by President Jammeh’s oppressive regime. As a co-founder and former managing editor of the now-banned newspaper The Independent in The Gambia, Jallow narrowly escaped injury in April 2004 when the paper’s office was set on fire by armed men, with the staff still inside. Jallow was finally forced to flee The Gambia in December 2004 after receiving death threats following the murder of fellow Gambian journalist Deyda Hydara. Since accepting his award from CJFE eight years ago, Jallow has remained an ardent advocate for free expression and journalists in The Gambia. He has been a fellow at Harvard University’s Nieman Foundation for Journalism in 2007 and attended world press freedom congresses around the world. Jallow’s most recent work, Delayed Democracy, concludes by considering steps that might improve press freedom in The Gambia. Such improvements, Jallow indicates, will only be possible if the political climate in The Gambia shifts, or if President Jammeh’s regime becomes susceptible to international political pressure. The Gambia is currently ranked 152 out of 179 countries on Reporters Without Borders’ World Press Freedom Index 2013. Alagi Yorro Jallow now works as a lecturer in Media Studies and Communications at the Department of General Management, Martin de Tours School of Management and Economics, at the Assumption University in Bangkok, Thailand.